CRYSTAL BLUE SPRUCE JUST DUG!!!! 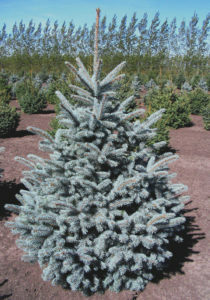 Crystal Blue Spruce is the best and toughest blue spruce variety for Manitoba! It is the most sunburn resistant and has an outstanding steel blue needle colour. This spruce has a broad pyramidal form, reaching an eventual height of 25′ with a spread of 10-15′. Perfectly sized for a city yard. DWARF APPLE TREES ARE READY TO PLANT!!!! Dwarf Apple Trees take up less space in your yard resulting in more yard for you to enjoy and less effort to harvest your crop. Dwarf Apple Trees are hardier because vigorous vegetative growth is reduced due to early fruiting. Don’t miss out – They sell out quickly! ©2010 Kackenhoff Nursery, All Rights Reserved.